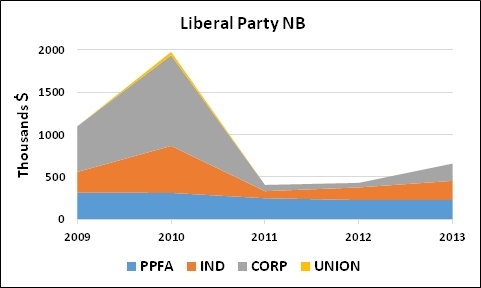 The Liberal Party clearly had a great deal of corporate support while it was in power, but, once in opposition, those contributions declined rapidly. It is not surprising that corporate donors might want to support the party in power, or the party most likely to take power in the upcoming election. In the Liberals’ case post 2010, that decline in corporate support was perhaps not just a function of being out of power, but also might reflect the unpopularity of the last Liberal administration. Now, the polls suggest that the Liberals have gained in popularity at the expense of the Alward government. 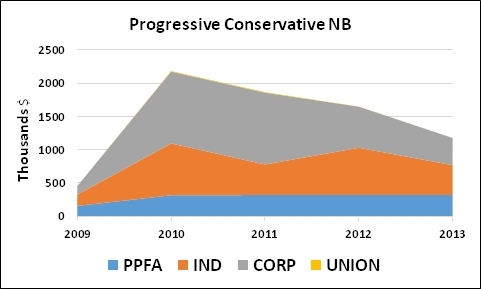 That perhaps explains the gain in donations over the past year, although they still trail the Progressive Conservatives in fundraising by a significant amount. 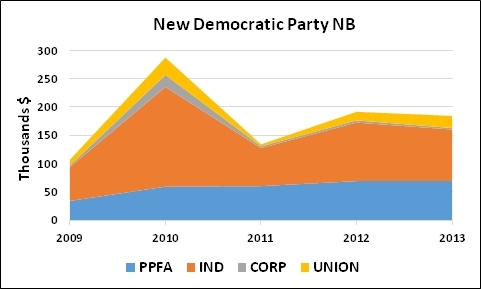 NDP fundraising also fell after the 2010 election, but rebounded fairly quickly. The numbers from 2013, however, show a slight decline over 2012. That is somewhat of a surprise given that Mr. Cardy, the NDP leader, has received a fair bit of positive press over the last year. The Green Party, on the other hand, seems to be on a roll. 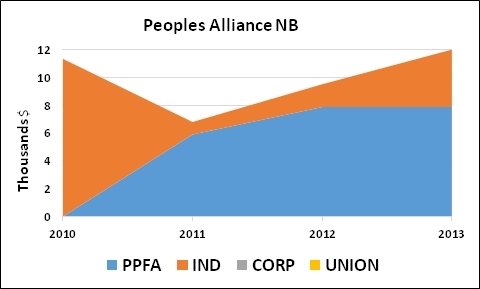 Although the total amount of funding is low compared to the three parties above, they have made significant gains each year. 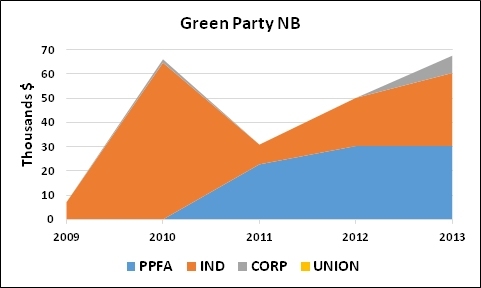 The PANB also has seen a gain in funding, although they trail the Green Party in total funds received by a substantial amount. The names of individual donors listed in the Annual Financial Return suggests that there is a reliance on a small group of supporters for funds. The PANB is the most reliant of all parties on funding from the government PPFA source, which some might find a bit ironic given some elements in their platform. Of course, funding is one thing, votes are another. Funding is just one indicator of a political party’s support with the electorate. Unfortunately, parties are only required to file reports on an annual basis, and the 2014 Financial Returns are not due until March 2015. However, the Liberals have tended to provide audited Returns on a semi-annual basis. If they do so in 2014, then we might have a better idea of their fundraising success by late summer, well in advance of the election. That might tell us something about Liberal (and, by inference, Progressive Conservative) popularity with the electorate. This entry was posted in Governance, Politics by Datapoints_NB102. Bookmark the permalink.